Okay let’s be clear, there is nothing magical about 3D scanners, but the technology they utilize is pretty close to magic, if you’re asking me. So, let’s start off first by what a 3d laser scanner actually is… It is a non-contact, non-destructive technology that by using a line of laser light, digitally captures the shape of an object. 3D laser scanners work by creating “point clouds” of data from the surface of the object. Essentially, what 3d scanners do is transfer a physical object’s height size and shape and transfer onto a computer as a 3 dimensional representation. They are very precise and can measure very fine details and that is why they are ideally suited for the measurement of complex, contoured shapes where there is complex geometry which requires massive amounts of data to be captured fully – something which cannot be accomplished with traditional measurement tools. 3D laser scanners are perfect for capturing free-form shapes by generating highly accurate point clouds which later can be used for many different applications that have to do with inspection and comparison with CAD data, or for creating a copy of the object with a 3d printer. So how is the data recorded in order to capture the object? Well, first the object that is to be scanned is placed on the bed of the digitalizer and then a special software drives the laser probe above the object. 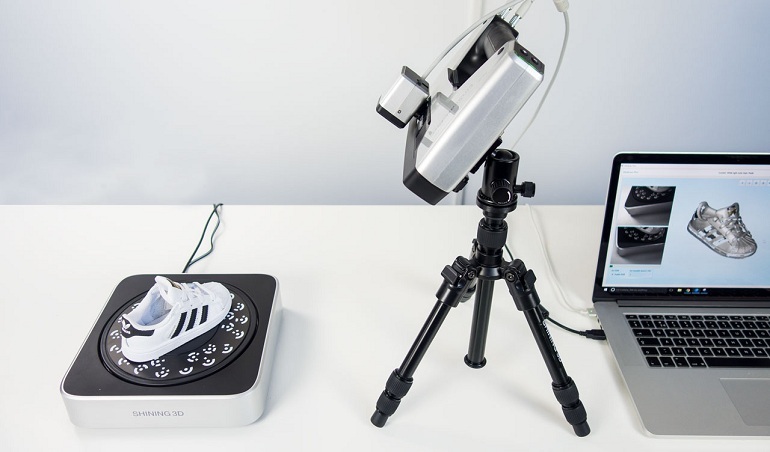 The 3d laser scanner projects a line of laser light onto the surface while two cameras continuously record the change in distance and shape of the laser line in three dimensions as it moves over the object. Then the resulting data of the scanned object appears as millions of points called a “point cloud” on the computer monitor, as the laser moves over and scans the entire surface and shape of the object. This process is very fast and precise and can gather up to 750,000 points per second. After the data is collected and the “point cloud” is created, they are merged into a three-dimensional representation of the object that can later be processed with various different software packages depending on the intended application. If the point cloud data is intended to be used for inspection, the collected data can be compared with the designer’s CAD nominal data. The comparison of the scanned object and the CAD data is represented in the form of a “colour map deviation report” in a PDF format, which visually describes the differences between the scan data and the CAD data.